Mike Bertaut, Chief Health Care Economist for Blue Cross Blue Shield Louisiana, reviews possible changes to the Affordable Care Act, now nine years old. What will happen to public health care in Louisiana if Congress or the courts strike down Obamacare? Bertaut notes that 53 percent of state residents are recipients of Medicaid or Medicare benefits. Actor and singer John Schneider discusses his life in Livingston Parish which includes a flood and bankruptcy. Schneider remains active and in Louisiana despite his recent challenges. Political Consultant Michael Beychok comments on Saturday’s vote on a half-cent sales tax for roads in East Baton Rouge Parish. Louisiana AFL-CIO Chief Louis Reine assesses another push to raise Louisiana’s minimum wage in light of Arkansas raising its rate to eleven dollars per hour. Louisiana is one of a handful of states remaining at the federal level of seven dollars 25 cents per hour. Actor John Schneider of the Dukes of Hazard on why he remains a resident of Holden and his holiday celebration in Livingston Parish. 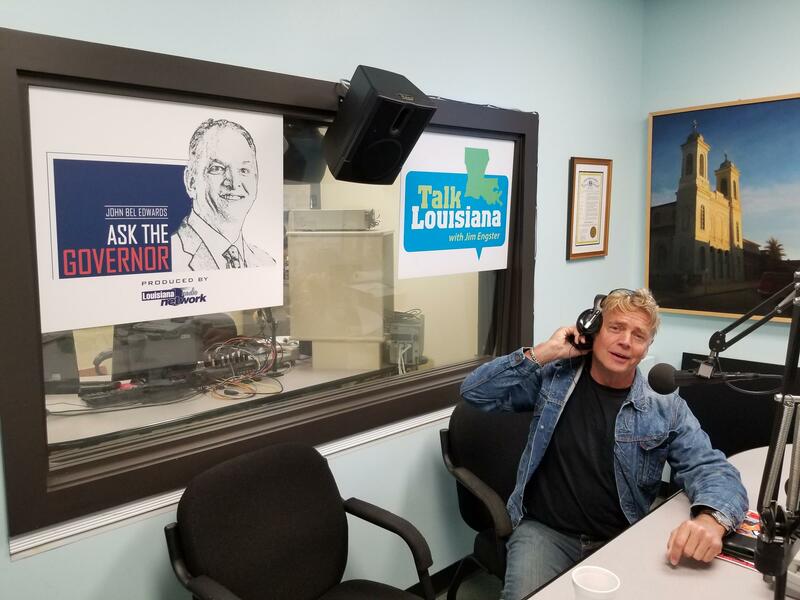 Actor John Schneider, famous for the Dukes of Hazards and now a Louisiana resident, is our guest for today's first segment. He discusses what's is like to have a new Louisiana driver's license, his studio here in the state, and how it is he stays healthy and in shape at the age of 54. Also, Dr. Hypolite Landry is our second guest and he joins us in studio just a day after turning 88 years old. He reminisces with Jim about setting the then world record for flying solo around the world in 1969, which he did in 13 days, 9 hours, 20 minutes. He as well remarks upon the time he had the opportunity to grace "The King's" presence and make an unexpected visit to Elvis Presley's hotel room at the Hilton Hotel in downtown Baton Rouge after The King canceled a concert. Hypolite and Jim discuss this and much more. And last but not least, author Steve Almond talks with Jim about his latest book Against Football: One Fan's Reluctant Manifesto. In his book Steve tells of why, after forty years of being a fan, he can no longer watch the game he loves for a multitude of reasons ranging from it's treatment & depiction of women as ornaments, to the frightening probability of brain damage the players can face, and much more. Actors John Schneider and Shanna Forrestall join Jim in studio to discuss movies and the Louisiana film industry. Schneider, famous for The Dukes of Hazard, and Forrestall, a Louisiana native actress, discuss their recent film Smothered. The film, directed by Schneider and starring Forrestall, was filmed in Louisiana at the newly established John Schneider Studios. Also, musician Bill Grimes and Vocalist Phillip Manuel join the show to discuss their upcoming concert Hot Summer Nights with Phillip Manuel and Wess WARMDADDY Anderson tonight, June 5th, at the LSU School of Music Recital Hall on the LSU campus. Blue Cross/Blue Shield Chief Healthcare Economist Mike Bertaut surveys the midterm impact on "Obamacare", and a governor's race that could heavily feature split opinions on the Medicaid expansion. Andrew Roberts discusses the legacy of Winston Churchill, and new biography "Churchill: Walking with Destiny". Healthcare Economist for BlueCross BlueShield Mike Bertaut talks Obamacare, Association Health Plans, rate decreases, and more on healthcare in Louisiana.